Save the date for the Intermountain Horse Association’s Poker Ride this September 7th in Alderfer Three Sisters Park. My son Asher and I have fond memories of the Poker Ride in 2010, as we were the winners of close to $500! Amazingly, we had the two best hands – not bad for a seven year old and his mom who had never played poker before! Knowledge of poker is obviously not required for this fundraiser, just the desire to get out with your horses and ride (or lead) in one of our beautiful parks. The entry fee is put in the pot which is split between the winning hand and local non-profits. The more entries, the more we win and support these important organizations! Overall, IHA seeks to represent our local horse community. They sponsor monthly meetings fall – spring (starting up again this September 17th) at 6:30pm every third Tuesday at the Evergreen Beau Joes Meeting Room, relating to the latest local horse issues and information. Plus, IHA members socialize and network with other horse people through a trail ride, clinic and two other gatherings during the year. ERPD co-sponsors the Poker Ride with IHA and generously provides the grounds, insurance and permit. Members register early for $25 or non-members for $30. The Poker Ride is taken completely at each rider or groups own pace. Riders leave as they wish and return in time to turn in their hand by noon. Asher and I sauntered along at a walk, enjoying the view and time to get out and ride together. In 2011, he rode Summer and I lead our yearling. Five stations are set up along the route where you draw one card per station. Members of IHA record each pick on your own card received at registration. When you return, your hand is tallied and the winner is determined. While the horses rest at the trailers happily munching on hay, IHA serves participants a great lunch where the winner is announced at 12:30pm. Sign up today for a fun ride to support local organizations and meet new horse folks! 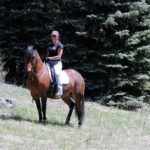 Go to www.intermountainhorse.com for more information and “like” them on Facebook for the latest at https://www.facebook.com/IntermountainHorse. Just two months away is the Colorado Corral Ranch Race at the Evergreen Rodeo Grounds! Anyone is welcome to participate and/or spectate. There are divisions for all ages and levels of riders and horses including Lead-line, Youth 8-10, 12-14 and 15-18; Green as Grass, Green Horse, Amateur, Open and a Jackpot. Email me at [email protected] for a registration form. What is the Ranch Race you ask? The Ranch Race is a fun course of 10-15 obstacles, similar to a trail course, but with more of a ranch twist including cattle. Fun and safety are of the utmost importance. Time is recorded and used mostly to keep the participants moving, but good horsemanship is rewarded every time. An experienced, professional judge scores each obstacle to determine the placings in each division. Running concurrently with the Ranch Race for the first time is a Western Dressage Ride-A-Test schooling show. Similar to a traditional Dressage Ride-A Test, participants will be assigned a ride time, ride their test, receive the scored test and have 10-15 minutes of ride time with the judge (USDF certified judge). Essentially a mini-clinic – with ribbons and awards! Just go to the http://www.westerndressageassociation.org/western-dressage-rules-tests/, look through the tests and decide which one you want to be judged on. While the Ranch Race and Western Dressage Ride-A-Test take place on Sunday September 15th, there will be a clinic on Saturday the 14th for both events taught by two of our gifted local trainers. Tucker Black – see www.TuckerBlackHorsemanship.com, will be giving the Ranch Race obstacle clinic. This is a perfect chance for any riders to learn and get their horses used to the obstacles that will be in the Ranch Race the next day. Kelly Hendricks- see www.KellysHorsinAround.com, participated in the Train The Trainers ™ put on by the Western Dressage Association to teach riding instructors the essence of Western Dressage and she will be instructing the Western Dressage Clinic on Saturday. While some riders will choose to participate in all four events (i.e. Ranch Race Clinic and/or show; Western Dressage Clinic and/or Ride-A-Test), anyone is welcome to participate in how ever many of the parts that they wish to. To see slide shows of past Ranch Race’s, go to the MtnHomes4Horses YouTube channel. 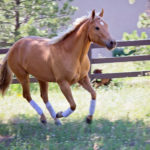 If you are new to Western Dressage, there is also a blog post on the www.MtnHomes4Horses.com website bearing the same name. The cost is $50 for the Ranch Race and Clinic, $30 for the Western Dressage Clinic and Ride-A Test. Entries open August 15th and close September 9th. Further discounts if you volunteer during the clinic and/or competition. See the Events calendar on the website for information and email me at [email protected] for a registration form. Always feel free to call me with any questions! 303-638-0994. I look forward to seeing you there for this weekend of fun and festivities! If you are interested in sponsoring awards, cattle, insurance, judging, etc, just let me know! 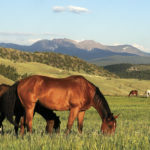 Mark your calendars for the Intermountain Horse Association Poker Ride September 7th, www.IntermountainHorse.com. Heather McWilliams © 2013. Here are several online brochures of our new listings just recently put on the market. Check out these amazing horse properties for sale in our area and share them with anyone who may be interested. These are all very special and amazing finds! Click on the link below to see the online version. Let us know if you would like a hard copy sent to you. Virtual Property Brochures! Let us help you buy or sell your horse property!